Cathedral Piper Tyrone Heade, performing his Grandfather’s instrument on-stage with the Yakima Symphony Orchestra, 2014. Cathedral Piper Tyrone Heade performs bagpipe music full-time, from tiny gatherings to large audiences in Washington, Oregon, Colorado and California for 25 years. Board of Directors, Celtic Arts Foundation (since 2008)Tyrone was given his Grandfather’s pipe, along with two faded photos and handwritten bagpipe music, when he was nine… and just kept playing. He quit his career September 1994 when a friend advised “Do what you love” (…and laughed at the thought!). 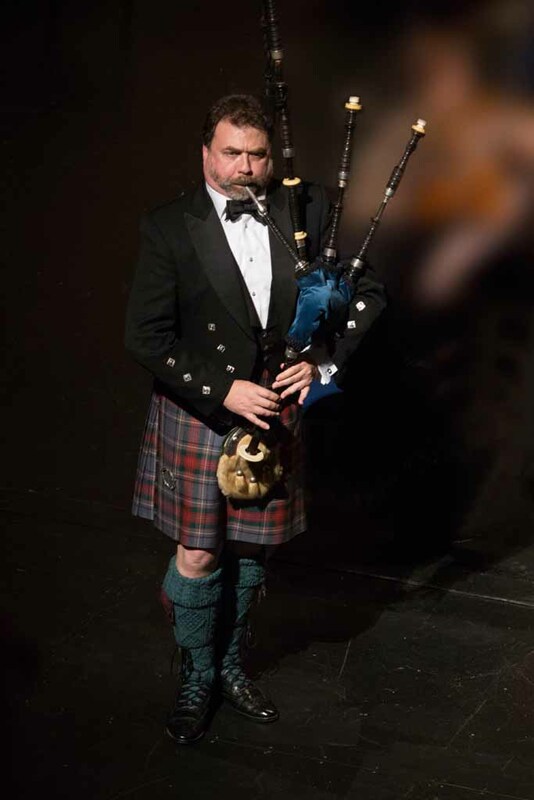 Asked to be Cathedral Piper in Residence for Seattle’s St. James Cathedral in 1990, followed by St. Mark’s Cathedral request for the same in 1993, Tyrone began a string of long-term commitments, further stoking his passion to drive bagpipe music forward. With pipes of different volumes and timbres, Tyrone developed an excellence for performance, instruction, composition, musical directorship and longstanding non-profit leadership. With gratitude, he has been trusted by noted musicians and non-profit leaders alike. Creating his own world-class “continuing education”, Tyrone helped to found, lead and develop the curriculum of the Mastery of Scottish Arts Winter School, bringing a world-class faculty to teach annually. The Winter School grew strength-to-strength from 1996 to 2008 when it merged with the Celtic Arts Foundation, an hour north of Seattle in Mount Vernon. Celtic Arts debuted its $2.6 million Littlefield Celtic Center performance hall in 2015. The Littlefield Center quickly became known for its quality Celtic music and acoustics; and, it has virtually no debt. The Winter School has consistently curated the best Bagpipe Music instruction in the world since 1996. St. James Cathedral, Christmas Eve Midnight Mass, Great Small Pipe, 2010, 2012, 2015; installation of two Seattle Archbishops, performances for four. merged with Celtic Arts Foundation, CAF Board of Directors (since 2008), president (2013 – 2015). Littlefield Celtic Center, groundbreaking Q4 2014, opened June 2015, thousands of visitors annually. $2.6 million dedicated performance space designed by HKP Architects, commercial kitchen, offices; virtually no debt.